Well, how many times have environmentalists chimed about the several benefits of greenery around the house? But all you care about the aesthetic right? Is exterior giving out good vibes? Is the interior looking good enough for Instagram pictures? There you go. Is the anxiety winding up because you missed out on the green memo? Fret not. Go get a jasmine plant for your room. Bringing in plants and greenery into the house bestows you with great air quality and increases oxygen levels as well. They help in combating depression and also keep you calm during panic attacks. Jasmine was used as the choice of study using lab mice. They were induced to extreme conditions, and the presence of the aroma of jasmine plants and its essential oil seemed to pacify the rodents. There were lots of tests conditions where brain scans proved that the fragrance of jasmine increases the levels of GABA on the nerve cells, and thus, anxiety is relieved and the organism slowly goes into a stable condition. Aromatherapy has been used by people around the world, while some might think it is a hoax, there are others who believe its importance in the healing process of the mind and body. Prof Hatt is one among the people who consolidated the grasp on aromatherapy in the recent natural healing market. He found out that administration of a new class of GABA receptor modulators parentally or through the air, we breathe has popped up infinite options like applications in sedation, excitement, anxiety, and treatment for aggression and induction of sleep. If you have been suffering from light sleep or rather deprivation, jasmine odour can help you get into a deeper sleep which thereby makes the quality of sleep much better. 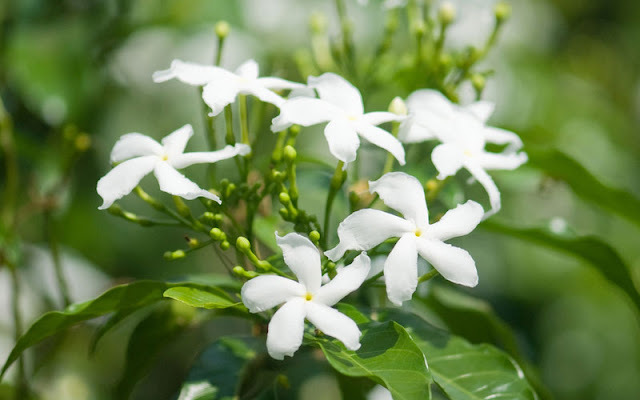 There have been participants who showed a positive response to the aroma of jasmine and claim to have rated the anxiety levels and vigour lower and their cognitive test results improved drastically. Essential oils are known to relieve you of certain pressures, and jasmine does exactly the same. It is an effective and natural method of boosting your mood, regulation of hormone levels, improves sleep and relieves one of fatigue and anxiety. It is a godsend remedy that is cost-effective, and most importantly, EFFECTIVE! Move over the artificial mumbo jumbo of capitalist room fresheners. You can get an air purifier, room freshener, and mood lifter, all packed into one teeny tiny plant. It looks pretty at your bedside table or window sill, and is a symbiosis like no other!